on Sea Lion Island - there is always new and unusual behavior to record! 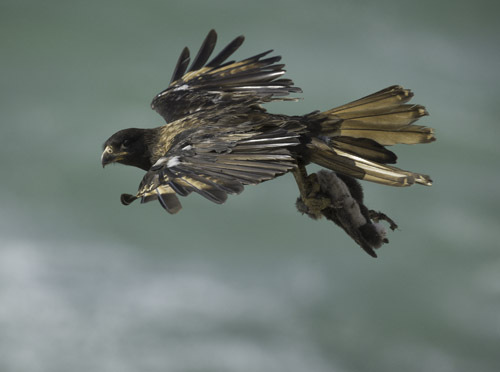 We love the Falklands, and consider it one of the best locations in the world for bird photography. 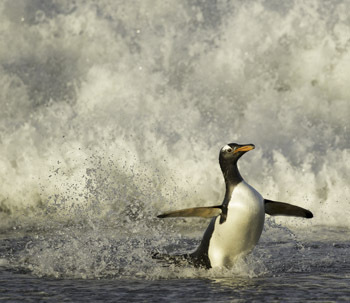 Five species of penguins, many species of song birds, water birds, and birds of prey, and all are approachable and easy to shoot. 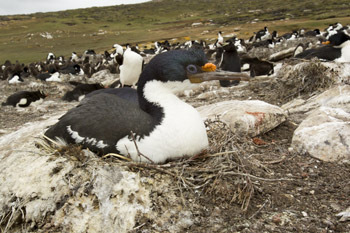 or our 2013 Trip Report for the Falklands. to photograph intimate views with unique perspectives. Group size is limited to 6 photographers, with two leaders, Mary and Joe. 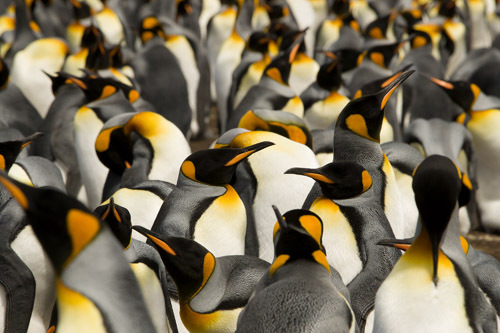 Five species of Penguins - more than you could see on an Antarctic trip! 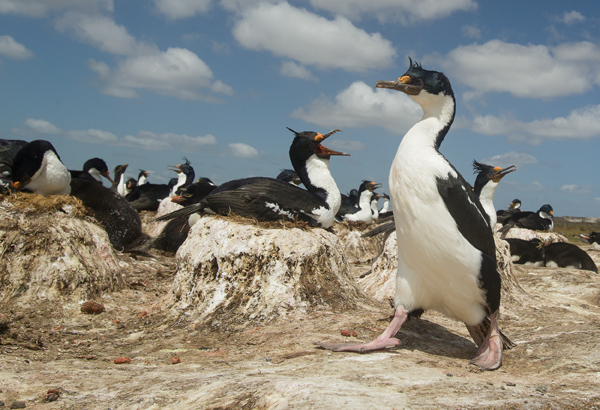 The Falkland Islands have been rightly compared to the iconic Galapagos, but in many ways the Falklands are an even more exciting location for photography. 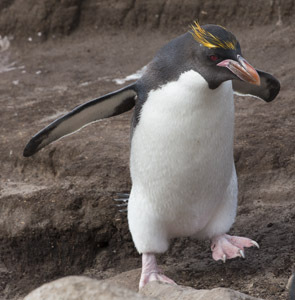 If you have visited the Falklands on a cruise, you have only scratched the surface. A LAND-BASED trip offers so much more, and we believe the shooting is far more productive and rewarding than a trip to South Georgia or Antarctica. 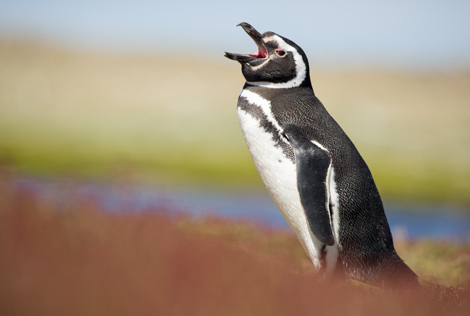 Granted, the Falklands does not have the grand scenery of those two locations, but it has a great diversity of wildlife. And, unlike a cruise, being land-based, and flying from one island to another, our trip's success is not dependent upon the weather. On a ship, if there are storms or high winds, you may not be able to land for any destination, but on a land-based trip, if the weather is poor and the planes don't fly, you stay on the island you're on, and you can keep photographing! That, to us, is the best thing about the Falklands. Rock-hopper Penguins returning to the sea bathe before continuing uphill to their nesting site. 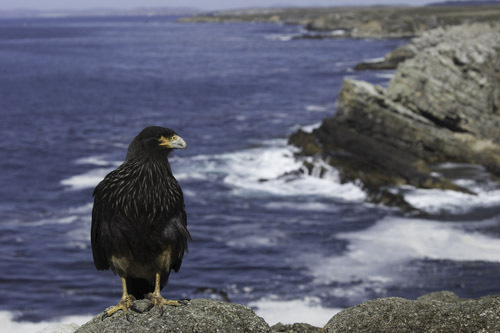 Comparing the Falklands to the Galapagos, again, the Falklands offer a tremendous advantage. In the Galapagos you are accompanied by a guide and your island visits are restricted to the beaches and to designated trails, and sometimes to a specific schedule for a trail walk. In the Falklands, we're free to wander wherever we wish, and our access is limited only to common sense and our concern to not disturb the wildlife. Wide-angle photography is common, and the largest lens we carry is a 100-400mm zoom! 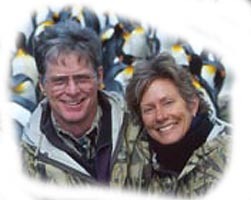 We've been travelling to the Falklands for nearly thirty years, and we know, and our friends with, many of the island owners, the drivers, and the various staffs. 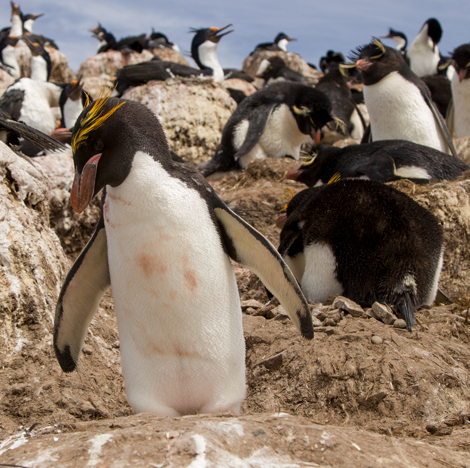 To us, the Falklands are like home, and we hope you'll join us on this incredible trip. Our Itinerary during our 2019 (cancelled) and 2020 tours differ. For both, we'll be visiting the top photography sites that are appropriate for the season. Which one you choose depends upon what you're most interested in seeing, although I must stress that the subjects will be virtually identical for both, but behavior, family life, chick size, etc. will differ. 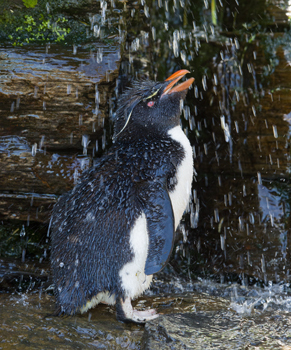 On the December trip (cancelled) Penguins will either be sitting on eggs or hatching small chicks. 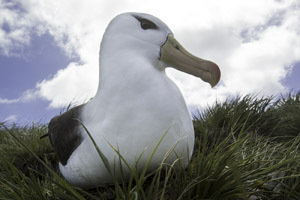 Black-browed Albatrosses will be sitting on eggs, although some eggs will be hatching and small chicks may be visible. 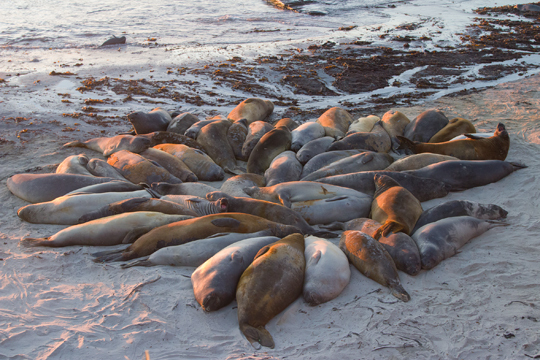 Elephant Seal pups are weaned, and may be going to sea, attracting Orcas, or Killer Whales. 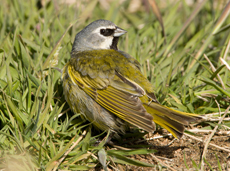 Songbirds and many shorebirds will be nesting, and most ducks and geese will be raising young. 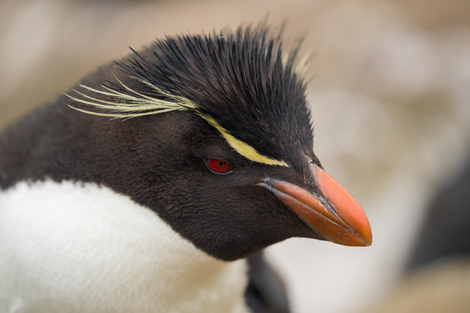 On the January trip Penguins will be raising chicks. 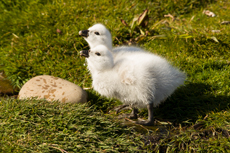 Albatross chicks will be common, with plenty of feeding activity. 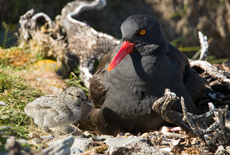 Most shorebirds and songbirds should be feeding or raising young. Orcas may be hunting Gentoos heading to or from the sea. 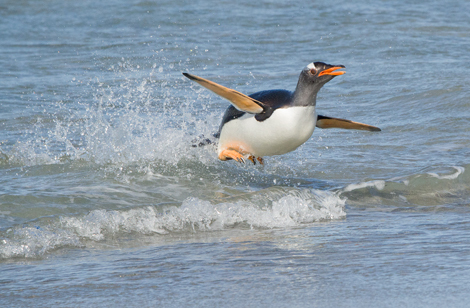 Gentoo surfing in; Macaroni hopping its way to the nest. 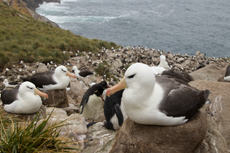 KingCormorant colony; Black-browed Albatross after landing on a tussock above me! Living Bird, Birder's World, and most nature/wildlife calendars. for you, but credentials seem to matter, and we have them. Flying Squirrels, Sunflowers, Cobras, Jupiter, Boas, Garter Snakes, Pythons, Rattlesnakes, Ducks, Chickens, Horses, and Cows, and a coffee table book, Out of the Past, Amish Tradition and Faith. Joe and Mary Ann McDonald. the Falklands, Antarctica, South Texas, Arizona, and some other spots, too!